In consistent fashion, no pun intended, we thought we’d continue to talk about the works of our lovely fashion students. It has been the month for it after all, with London Fashion Week, Milan Fashion week and the final runway spectacle for the season in Paris this week. Who’s been your favourite designer? Did you get to the chance to see John Rocha’s AW14 collection at London Fashion Week? True to form, we saw the incredibly formed organza hats, ruffles and corsages. For the non-fashionista reader, Organza is a sheer fabric traditionally made from silk. Leona Kibble could probably tell you a lot more about it though as she recently illustrated John’s AW13 collection which featured many of the oversized organza sculptured headpieces we saw at London Fashion Week a few weeks ago. Leona is studying Fashion Illustration at the London College of Fashion; a course enabling students to explore a range of traditional and contemporary approaches to drawing and image creation. Hats off to the University as the calibre of work we are seeing from their students is all pretty fantastic. Let’s not undermine the talent of the students themselves though… and we’ll refer to Leona who we worked with on one of her recent University projects to collate her illustrations of John Rocha’s AW13 collection. 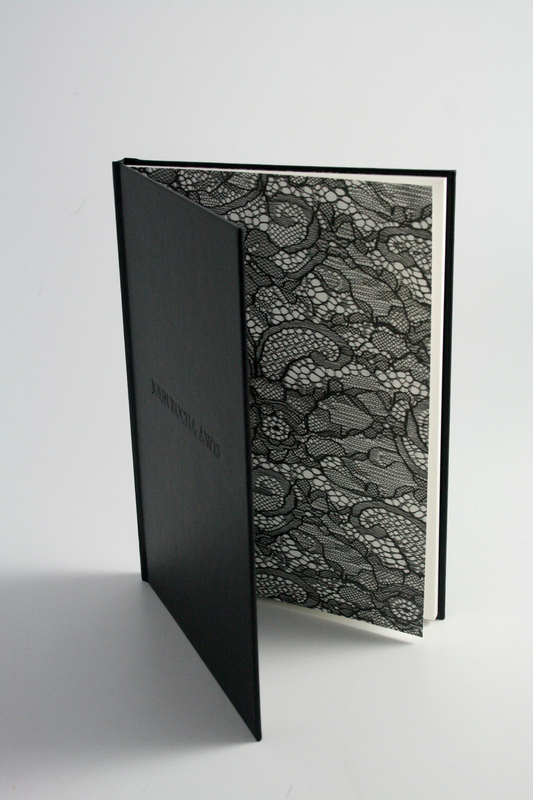 Leona’s showcase of work was bound using a faux leather black cover with blind deboss lettering on the front. Black lace artwork was printed and used for the inside covers working incredibly well with the lace and darker undertones we saw across the line. Leona’s illustrative look book was a unique and true resemblance of the textures, tones and style featured in the AW13 collection which you can see here. We hope you were happy with the final piece Leona? Let us know how your book was received and we hope to see some more of your designs in the near future.